Spread Betttng: How Much Money Do You Need? You are here: Home > Learn Spread Betting: Training Course > Spread Betting: How Much Money Do You Need? Spread Betting: How Much Money Do You Need? This is one of the most common questions and the answer is generally pretty straight forward but there are a number of points to consider when allocating the right amount of capital for your circumstances. Generally speaking you need as much money in your account that will allow you to reach your financial objectives whilst being able to survive through periods referred to as drawdown. Drawdown is used to describe what happens when your account suffers a series of losses and your account goes from its current point to a lower point. If for example your account was sitting at £10,000 and then fell back to £8,000 your drawdown is 20 percent. Professional traders should probably be called professional risk managers as they are always seeking opportunity but balancing each trade with regards to the amount of risk on the trade. As a general rule many professional traders never risk more than 1-2% of their overall capital on any one trade at any one time. Now you might be thinking ‘Well that’s ok for them, they are trading with £10 million dollars or more’ but the reality is you need to preserve your capital at all costs in order to live to fight another day and access more opportunity. If you wipe out your trading capital then you are out of the game and your ability to access opportunity plummets to zero. £1,000 Account or a £20,000 Spread Betting Account? If you are going to continue on the path of a professional trader you need to be risking less than 1-2% of your overall capital per trade, so let’s take a look at what that looks like with various account sizes. Figure 2 above illustrates what happens when you risk 1 or 2% of your account on any one trade. What most people don’t realise is that the less money you have the harder it is to allocate risk effectively on any one trade. With just £1,000 in your account you’ll notice that it’s very difficult make a profit. If you are at this level then the previous section on finding the best value provider will be very important. Unfortunately many new traders fall into the trap of starting with £1,000 or less and continue to risk £50 to £100 or more per trade. 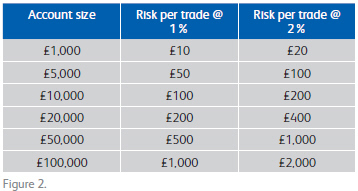 This means your risk on those trades is 5-10+% of your trading capital (£1,000/£100 = 10%). Van Tharp, one of the world’s top authorities on professional risk management techniques, would refer to traders risking more than 4% per trade as ‘gunslingers’, which basically means you’d be trading like a wild cowboy in the wild, wild west. Not something in tune with professional risk management I’m sure you would agree! With a £20,000 account balance, risking only 1% per trade, means you’ll have £200 risk on the trade and ideally you should only be looking for trades where the potential reward or opportunity is 2-3 times the size of your risk. In effect you will want to be risking £200 (1% of your capital) in order to achieve a £400-£600 (2-3%) return. Professional business people and successful traders generally have one overriding aspect to their business which is being sufficiently capitalised. The smartest business people build strong business plans which include being capitalised and contingencies for what might happen if cash flow gets tight. You’ll also notice during times of uncertainty the well capitalised companies are able to ride through the storm and not only thrive but usually buy out their competitors. It’s the same when it comes to trading the markets. Give yourself the opportunity to be well capitalised and if you don’t have access to £5,000 or more as your trading capital then be sure to start small and build your trading account up over time. Focus on protecting your account and only trading those opportunities with a favourable risk/reward and over time you should find your ability to compound positive, steady returns is heightened. The less money you have, the more risk you’ll be taking on each trade, relative to your account size. The more money you have, the safer you can allocate risk as a percentage of your overall capital. Thanks to Capital Spreads for this educational feature. The following questions are not designed to cause you any stress. Honestly! They are designed to reinforce the ideas and concepts we have looked at in this e-book and to be mindful of the factors that can affect spread betting from a trader’s point of view. Risk can take many forms; some forms of risk are more obvious than others. Take your time, make yourself a cuppa, see how you get on. Answers are here, but no cheating! 1. Fill in the missing blanks: The bid refers to the price at which I can **** a spread bet and the ask is the price at which I can *** a spread bet. The difference between the bid and ask is called the ******. 2. Why is spread betting called ‘spread betting’? 3. Name one disadvantage to leverage. 4. How can traders who use spread betting take advantage of markets going down in value that shares traders cannot? 5. Who regulates the spread betting industry? 6. Spread betting is suited to individuals with an addictive personality. True or false? 7. How does a trader borrow money from their spread betting provider? 8. What is the current highest rate of capital gains tax in the UK? 9. Name one reason why some people lose at spread betting. 10. Describe how you feel about spread betting.